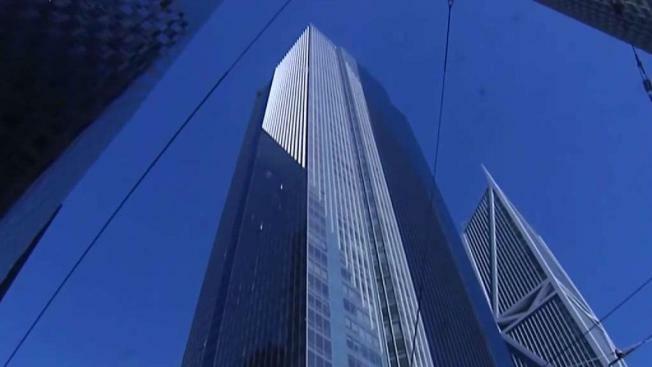 The city had just declared the Millennium Tower safe from the very concern that is now a suspected cause in the sudden crack in a 36th floor window at the luxury high rise, NBC Bay Area’s Investigative Unit has learned. Crews were back at the tower Wednesday as work there continues to determine why the window in unit 36B suddenly failed on Sept. 1, forcing the building to be surrounded by scaffolding to protect pedestrians. A consultant’s preliminary report suggested the window failure could be the result of the tower’s tilting triggering separation of the outer façade, or curtain wall, from the concrete framework of the building. That problem was highlighted earlier this year, when NBC Bay Area reported how Paula Pretlow, who owns unit 31B, had learned that a consultant worried about the risk caused by gaps they found inside her walls – between the glass and steel façade of her unit and the concrete interior structure. The openings, experts warn, can allow fire to spread rapidly between floors. The city issued a violation notice against the building and ordered an investigation. In a response to the Millennium Tower Homeowners Association’s lawyer in February, the same firm concluded that a check of five units – all on the southern side of the tower – showed gaps that were within normal expected range and not the apparent product of tilting. In August, the city Department of Building Inspection issued a report citing that conclusion as proof the building was safe. It declared the investigation over. By then, the gaps in Pretlow’s unit had been sealed. “It essentially said the building is still safe for occupancy from those basic life safety standards,” said William Strawn, spokesman for the Department of Building Inspection. But City Supervisor Aaron Peskin questioned why city inspectors would accept a report that only evaluated units on the south side of the building – given the problem was discovered on its northwest side, where the building is tilting. “They’ve looked on the wrong side of the building,” Peskin said, adding that the city accepting such incomplete findings was just one more reason it needs to enlist outside experts to get to the bottom of the problem. Strawn said the department has to rely on outside experts, in this case hired by the building owners, not the city. In fact, the same consultants with Allana, Buick and Bers are evaluating what led to the window’s failure. “Clearly our engineers agreed that, according to this report, that there was no concern right now,” he said. Late Wednesday, Strawn issued an update, saying Allana, Buick and Bers couldn’t get into Pretlow’s unit after she had refused. DBI believes, he said, the firm simply “erroneously omitted it [36B] from the report sent to DBI.” But he wasn’t able to verify that as of late Wednesday.